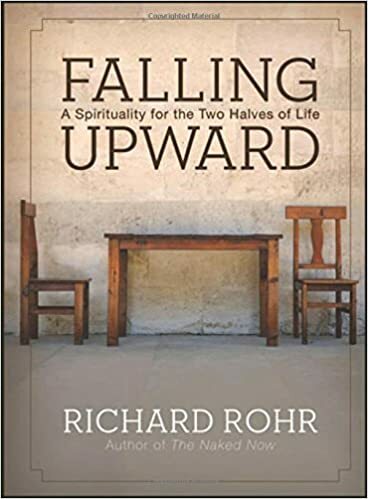 I recently finished reading Richard Rohr’s book, Falling Upward. It was recommended to me by my friend Chelsea awhile ago. Still, the timing of my reading worked out nicely with a recent birthday (getting deeper into my 40s) and a special trip to Scotland. To be honest, the introduction and first couple chapters of the book were frustrating. They felt overly repetitive. They drew from too many sources, including ancient Greek mythology, Hindu, Buddhist, Muslim, and Christian theology. Everything was trying to make the point that there are two halves of life: (1) an identity formation half and (2) an informed sense of awareness and activity that flows from (but also sometimes runs counter to) the first half of life. I was almost ready to abandon my reading of the book at the end of the Introduction and the beginning of Chapter One… But I’m glad I kept going, as the book started to gain some traction later on. Chapter Three was genuinely compelling. I appreciated its descriptions of the paradox of needing both Law and Grace, Conditional Love and Unconditional Love, the Loyal Soldier and the Discharged Citizen. And I thought Rohr did a good job of laying the groundwork for why people in the second half of their lives are uniquely qualified to live within the tension of such a paradox. I especially enjoyed Rohr’s story of Japanese soldiers returning to society at the end of the Second World War. Japanese communities created a communal ritual whereby a soldier was publicly thanked and praised effusively for his service to the people. After this was done at great length, an elder would stand and announce with authority something to this effect: ‘The war is now over! The community needs you to let go of what has served you and served us well up to now. The community needs you to return as a man, a citizen, and something beyond a soldier.’ In our men’s work, we call this process ‘discharging your loyal soldier.’ this kind of closure is much needed for most of us at the end of all major transitions in life. Because we have lost any sense of the need for such rites of passage, most of our people have no clear crossover to the second half of their own lives. I appreciated the way that the book went on to explain this transition. And honestly, it got me more and more excited for the second half of my own life. The book put words to some of the things I’ve already started thinking and feeling in my relationship with God, my perspective on ministry, and the general dynamics I’ve been experiencing in my own transition from the first half of life to the second half of life (which Rohr suggests usually happens between the ages of 35 and 55). The rest of the book — about living in the second half of life — is simultaneously intriguing and uncomfortable. I resonate with some of the thoughts about finding God in my smallness and finite limitations (some of the descriptions in Chapter Seven make it more clear why I enjoy my Friday extended times with God out in nature as much as I do). I jive with Rohr’s sense of cynicism towards the world’s systems and a more open-handed, open-minded approach to understanding and pursuing God. Still, there’s a level of Universalism that undergirds many of Rohr’s observations through the latter chapters of the book which I find unsettling. Am I still clinging too tightly to “first half of life” dynamics? Or am I holding fast to Scripture which seems pretty clear about a “wide road to destruction” and many other aspects of sin and judgment and separation from God? I’m very much in favor of being less quick to leap to conclusions about others… or holding our own dogma at arm’s length from time to time… or just quitting with the pretense of knowing precisely how the mechanisms of the universe work on every point of theology or philosophy or science… So I can appreciate a lot of what Rohr is trying to say — but he pushes the line a bit further than I would be inclined, in some of his theology. Overall, I’m glad that I read this book. I think it provided some valuable fodder for prayer and reflection. I feel more excited about leaning into the second half of my life than I did before reading the book — so especially for that reason, I would recommend the book to anyone in that window between 35 to 55 years of age. This entry was posted in God, Health, Introspection, Leadership, Recommendations, Recommended Reading. Bookmark the permalink.